The best-selling author of Big Data is back, this time with a unique and in-depth insight into how specific companies use big data. Big data is on the tip of everyone's tongue. Everyone understands its power and importance, but many fail to grasp the actionable steps and resources required to utilise it effectively. This book fills the knowledge gap by showing how major companies are using big data every day, from an up-close, on-the-ground perspective. From technology, media and retail, to sport teams, government agencies and financial institutions, learn the actual strategies and processes being used to learn about customers, improve manufacturing, spur innovation, improve safety and so much more. Organised for easy dip-in navigation, each chapter follows the same structure to give you the information you need quickly. For each company profiled, learn what data was used, what problem it solved and the processes put it place to make it practical, as well as the technical details, challenges and lessons learned from each unique scenario. 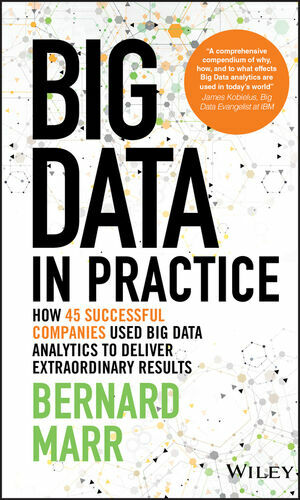 BERNARD MARR is a bestselling business author, keynote speaker and consultant in Big Data analytics and enterprise performance. He is one of the world's most highly respected thought leaders on data in business and regularly helps major companies and governments gain better insights from their data. Bernard is a frequent contributor to the World Economic Forum, writes a regular column for Forbes, and is recognized by LinkedIn as one of the world's top 5 business influencers. He is the author of numerous books including Big Data (winner of the Futures Category at the CMI Management Book of the Year Awards 2016), Big Data for Small Business For Dummies and Key Business Analytics.